EBJI » 6 Medals for EBJI at the USJF Junior Nationals! You are Here:EBJI >> News >> 6 Medals for EBJI at the USJF Junior Nationals! 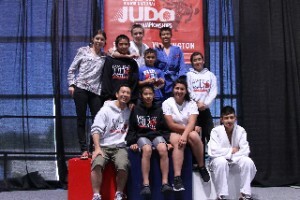 6 Medals for EBJI at the USJF Junior Nationals! Comments Off on 6 Medals for EBJI at the USJF Junior Nationals! Over 500 competitors from around the country gathered at the USJF Junior National Championships this past weekend to participate in the two-day tournament with hopes of winning a National Title. The tournament was held at the Spokane Convention Center in downtown Spokane, Washington. Several local athletes have been training for months in preparation for this National event. Representing the East Bay Judo Institute were seven athletes who traveled to Spokane to represent themselves and our dojo. Cole Filson (8 yrs) and Estefany Gonzalez (15 yrs) both competed on Saturday July 7th, the first day of competition. Cole, an Albany resident, set a great tone for the group winning three matches in a row to win the gold medal in the Bantam 1, 27 kilogram division. It was Cole’s first time competing at a national tournament and he did extremely well, winning many of his matches with brilliant technique. Estefany competed in the Juvenile B, 70+ kilogram division. After winning her first match by a walkover, Estefany had 4 more matches against formidable opponents. Although she was not able to win, she was awarded a bronze medal for her efforts. This was Estefany’s second Junior National medal, as she took silver at last year’s National Championships. On the second day of competition, five teenage boys represented EBJI in style, all competing in the Juvenile A (13-14 yr old) age group. Nico Gonzalez (14) led the way for EBJI competing in the 53 kilogram division. After losing all his matches last year, this year Nico was determined to do well. He won all his matches by ippon (full point), including an overtime victory in the finals against a tough player from Hawaii. After winning gold in his division, Nico also competed in the team tournament, representing Daiheigen Yudanshakai. He won 3 more matches by full point. For his efforts he was awarded the Most Outstanding Male Player of the tournament. Curtis Booth (14) also won gold in the 48 kilogram division winning 3 matches in a row. En route to the gold, Curtis encountered a familiar opponent, Myles Honda, who had previously beaten him at the state championships a few months ago. This time Curtis was able to throw Myles for yuko in Golden Score (overtime) to re-gain his National title. Nathan Canadas (13) and Masashi Matsumoto (12) both picked up silver medals in the 44 kilogram and 40 kilogram divisions respectively. Their only losses came to the eventual gold medalists of their division and both showed vast improvement. Satoshi Matsumoto (12) also competed in the 48 kilogram division. After losing to teammate Curtis Booth, Satoshi lost a controversial match for the bronze medal. The players were accompanied by coaches Ken Kokka Sensei and Sayaka Matsumoto who were extremely proud of everyone’s performances. All athletes gave everything they can in all their matches, which is really all that can be asked of them.